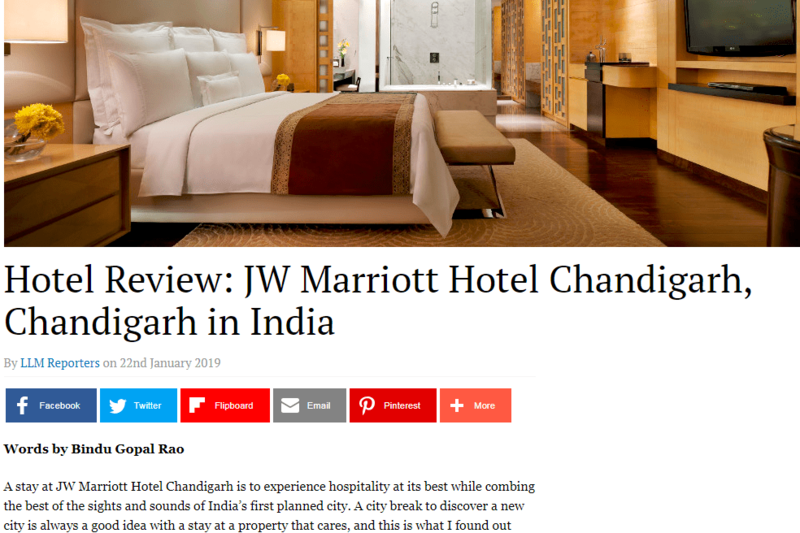 A stay at JW Marriott Hotel Chandigarh is to experience hospitality at its best while combing the best of the sights and sounds of India’s first planned city. A city break to discover a new city is always a good idea with a stay at a property that cares. And this is what I found out when I checked into the beautiful JW Marriott Hotel in Chandigarh recently. Welcomed by the staff at the airport I was whisked off in a hotel car but not before my luggage was identified and tagged with a personalized name tag. The under half hour drive itself seemed like a breeze courtesy the tree lined broad roads of the city. As my car pulled up to the porch, I was given a traditional welcome with drum rolls and a garland and I knew instantly that this was going to be an experience like no other. Sipping on my welcome drink, I was told that my check in formalities would be done at the room and I was led to my sixth floor room in the executive floor. My Executive Club room was spacious and well laid out with a large bathing area with separate shower and bath tub and a dresser as well. A comfortable king side bed, study table and television as well as a cupboard and other amenities were part of the room. 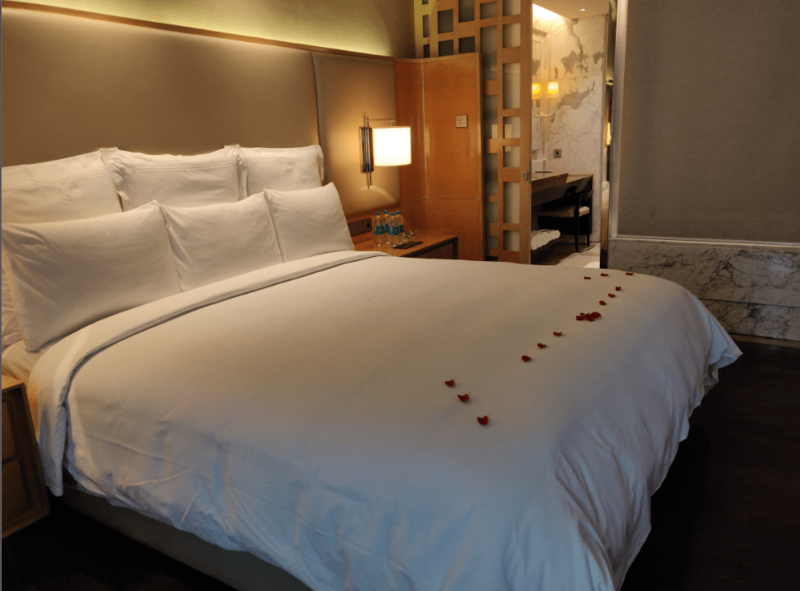 The other categories of rooms here include the Deluxe Room that has one King or two Double beds and a City view, the Luxury Suite that has a bedroom and living space and executive lounge access and an expansive Presidential Suite that is patronized by the many celebrities that visit the city. The rooms are serviced twice daily and as part of the turn down service there is an energy bar placed in the room as well. 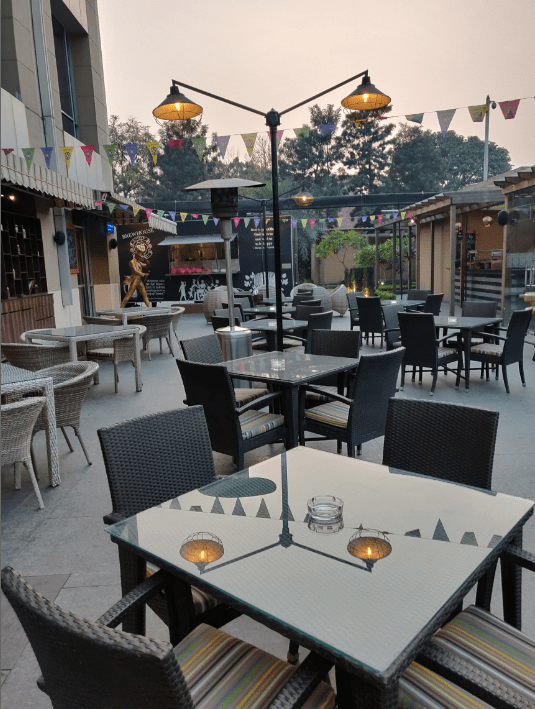 The centrally located hotel is not just close to the airport and the railway station but also to the Business District – Sector 17 and the Information Technology Park. The hotel is designed around the five elements of nature and the grand entrance completed with crafted water bodies and flaming torches and use of natural materials like travertine and sycamore wood makes sure that the hotel merges seamlessly with the rest of the city. This is also in line with famous French architect Le Corbusie philosophy who designed the city of Chandigarh. Designed by Wilson Associates from Singapore and Karen Kim from Marriott the hotel has a contemporary chic architectural style and an understated luxury. With 164 spacious rooms, including four suites and one presidential suite the rooms have been designed to meet the needs of the new age traveler. There is artwork all around and the reception has a 3D painting that depicts the booming economy of India with the colours Yellow depicting the Rising Sun; red depicting that the economy is booming and green depicting the wealth and prosperity of the country. The metal sculpture displayed on the wall in the lobby represents a tree which is symbolic of India and the branches are reaching out to the world. The hotel has several dining options and naturally food and beverage drives over 50 percent of their business. The Café@JW is a contemporary all day dining restaurant that serves an extensive buffet for breakfast, lunch and dinner based on occupancy levels apart from an a la carte menu. With several live and interactive stations there is a buzz here that is unmissable. The lobby level has the Deli and Patisserie Chandigarh Baking Company where you can tuck into freshly baked goodies, cakes, pastries and freshly brewed coffees and. You can check out the place for its hi-tea snacks, savoury sandwiches and burgers, fresh muffins, cookies and croissants. The Indian fine dining restaurant Saffron is where you can sample the best of Indian fare especially North West Frontier cuisine. 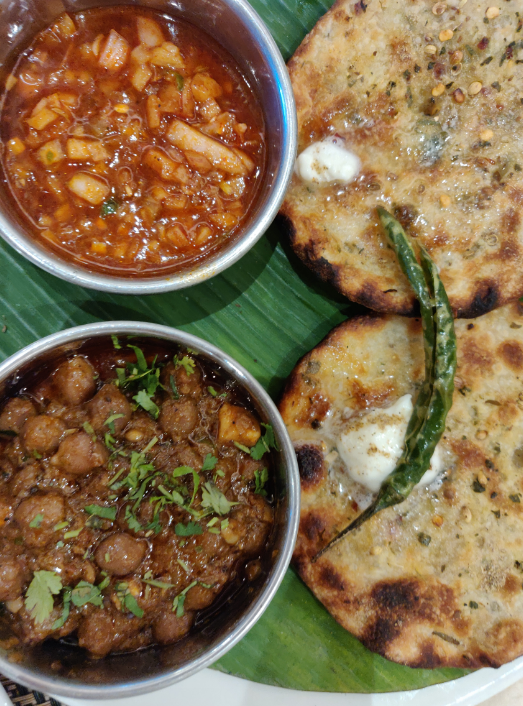 This is also the place to sample local delicacies like Amritsari Macchi, Saffron Tandoori Murg, Raunak-e-Seekh, Kadhai Jhinga, Raan-e-Sikanderi and Tari Wala Desi Kukkad. If you love beer, 35 BREWHOUSE the first microbrewery to open at a five-star hotel in the region is the place to experience the finest of malts, hops and yeast procured from Germany, Belgium, Czech Republic, US and UK. An inhouse food truck dishes out comfort food to match the drinks so you can spend an enjoyable evening to the pulsating beat of live music. If you are here on Sunday, do not miss the Sunday brunch which is all things food and fun. If you are staying on the executive floor, you can access The Executive Lounge, a private lounge that offers complimentary breakfast, high tea and a happy hour service. The JW Marriott Hotel in Chandigarh has a rooftop swimming pool with a panoramic view of the city and has an infinity feeling. For health watchers the JW Fitness Club a fully equipped fitness club with cardio equipment, free weights, fitness assessments and personal trainer is open 24 hours a day. This is also a great venue for events with the Grand Ballroom that has a ceiling height of over 6 meters complete with crystal chandeliers. A whopping 30000 sq feet area including indoor and outdoor space for meetings and banqueting facilities is available in house. The banqueting space can be divided into smaller rooms using the separator walls so you can customize the space according to your requirement. The Living Room based on the concept of a New York style apartment, is a space for business meetings that comes with an open kitchen, lounging area and an open foyer. The tech-savvy meeting rooms are equipped with a large drop down screen with lift projector and a surround sound audio-visual system as well as high speed Internet access. For a relaxing getaway head to the Quan Spa an oasis of calm, tranquility and relaxation. The six spacious private treatment rooms offer Balinese, Swedish, Ayurvedic and Western treatments using natural products.So there you have it – a space to work and play – that is JW Marriott Hotel Chandigarh, where hospitality comes with a distinctive personal touch.